The Trials of Patricia Isasa – an opera in two acts – is based on the life story of the Argentine architect and human rights activist Patricia Isasa. In 1976 Patricia Isasa was abducted, imprisoned and tortured by the military junta that ruled Argentina. She was a high school student and just 16 years old. Isasa was one of as many as 30,000 citizens who were “disappeared” in Argentina, often for activities such as belonging to a union, working with the poor or voicing opposition to economic and political policies. Very few survived. Patricia Isasa was held for 2 years but never charged with any crime. After her release, Isasa felt compelled to find out who had been responsible for her abduction, torture and detention in a secret prison. After completing her education and while simultaneously working as an architect, she spent several decades researching the seemingly impossible – as recounted in the Argentinian tv documentary about her case, El Cerco. 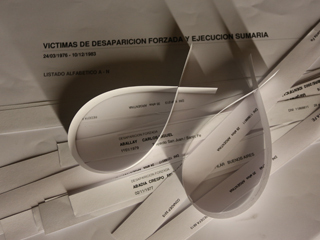 In 2009, 33 years after her abduction, she managed to identify and bring her torturers to justice. Six of Isasa’s torturers were sentenced to 19-23 years behind bars. Those convicted included a federal judge, a chief of police and the mayor of her hometown. The opera explores questions about amnesty of government officials, the use of torture to achieve political ends, and what it takes to create – and to challenge – a culture of impunity. Development of the opera included two workshops at Dramatikkens hus in Oslo, Norway in 2012 to develop the libretto with playwright Naomi Wallace and dramaturg Bibbi Moslet; readings of the libretto with professional actors at Tekstlab and Cafeteatret in Oslo; a concert performance of three arias with Ensemble Pi in New York; two workshops in Montreal at the Oper’Actuel works-in-progress showcases in 2014 and 2015; and a two week workshop to develop two scenes at a seminar on new opera creation at Dramatikkens hus in Oslo. The Trials of Patricia Isasa was presented in a public concert reading at Roulette Intermedium in Brooklyn, NY, on January 13, 2016, and premiered in a Chants Libres production at the Monument National Theater in Montreal, Canada, May 19-21, 2016.